This entry was posted on Saturday, September 2nd, 2006 at 9:58 am and is filed under America, photography. You can follow any responses to this entry through the RSS 2.0 feed. Both comments and pings are currently closed. Here here! Why does this happen? It must stop. Stop the mushy peaches! I have received an email from a peach grower who believes that I am being very unfair in this posting to assume and publicize that the mealy peaches are the fault of the orchard. He claims that it is not the growers’ fault. He wrote that growers refer to this mealiness condition as “internal breakdown” and that it is the result of improper handling after the fruit leaves the orchard’s facility. Well, it was not my fault, as I never place fresh peaches in the refrigerator. I was also troubled to learn that the peaches that I purchased during the peak growing season were from California, not the Eastern states, as I had been led to believe by the grocer. I just bought what I thought were fresh peaches from a grower in _____ Colorado from a fruit stand. The samples we had were fantastic and this is about the time of year I do my peach buying. I bought a case of these and all of them are mushy and taste pretty lame. Not like the cut pieces that were sampled. The brand of peaches are _______ from Colorado. I don’t recommend buying from these growers. I think I am also going to let one of the largest produce suppliers in the Midwest (C&C Produce in Kansas City) know about these funky peaches too. Now I to figure out if 25lbs of peaches are salvageable in this state of mush, or if they are just compost. When I read your message I had just purchased two beautiful peaches at Trader Joes here in Virginia that were from Colorado. I’ve never purchased peaches from Colorado before, so I was suspecting that I would be disappointed. But I ate one today and it was delicious. Fruits such as peaches, plums, etcetera get ruined by being refrigerated at a temperature too low. It can happen during shipping or when stored at the supermarket. That’s why we have to look for peaches in the summer at the farmers’ markets. 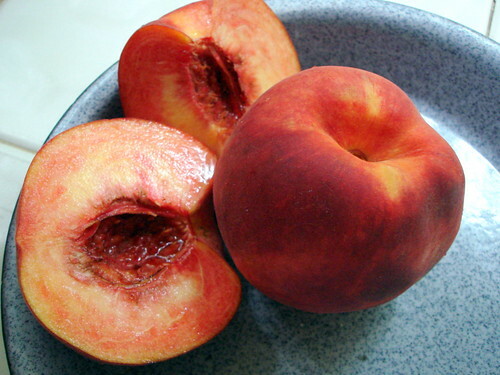 mushy peaches are awesome, they are, at least in my opinion, a bit more sweeter and the pit comes right off. maybe you just have bad mushy peaches? It’s not just mushy, it’s mealy. There’s a huge difference. I have been disappointed so many times lately in the peaches I get that I’m reluctant to even buy them any more. A juicy soft peach is fine; it’s the peaches that taste grainy and just plain bad that she’s talking about. I, too, stumbled across this posting after biting into too many really bad peaches. I have a peach tree and the peaches are mushy when I pick them. They are not over ripe. I am wondering if it is the type of peach and if I should remove the tree, any comments appreciated. I live in Australia.